[Update June 10: There are two personal benefits from Cash for Clunkers. One is the voucher. That one's clear. But the other benefit is the dollar value of the gas savings that result from a trade in. That one is less obvious because gas savings are a not a one-to-one function of MPG increases. 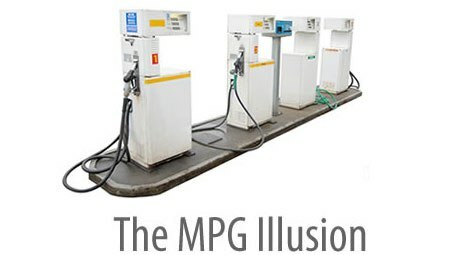 The table below shows how different levels of Miles per Gallon (MPG) translate to Gallons per Hundred Miles (GPHM). You can easily calculate the gas savings from a trade in by subtracting the new GPHM from the old one. For example, trading in a 17 MPG car for a 28 MPG car saves 5.9 minus 3.6 = 2.3 gallons per hundred miles. That saves more than 200 gallons of gas (and $500) over 10,000 miles of driving. It also saves 2 tons of CO2 emissions over that distance. The gas cost calculations below assume that gas costs $2.50 per gallon. Here is a downloadable version of the table below. These tables directly caclulate the gas and cost savings of trading in a car that gets 18 MPG or less for different combinations of cars with higher MPG. Finally, this online calculator will let you compare gas consumption and gas costs for any combination of MPG, driving distance, and gas price. It also allows you to calculate gas consumption and cost information on 2009 cars.